With these dire words of warning from Augustine, even Ecclesiastics saw the benefit of keeping houses of ill repute operating in medieval cities. Prostitution was a vice that was considered a necessary evil in the Middle Ages because it was a means to curb “men’s lust”. Ecclesiastics felt that if brothels weren’t available to men in cities, they would find other inappropriate outlets for their entertainment and endanger the virtue of innocent women. In an effort to prevent potential problems, civic officials permitted prostitution to function within the city walls so long as it was regulated and turned a profit. Professor Michael M. Hammer (Institut für Geschichte, Universität Graz), spoke about the regulation of prostitution in Late Medieval and Early Modern Austria. 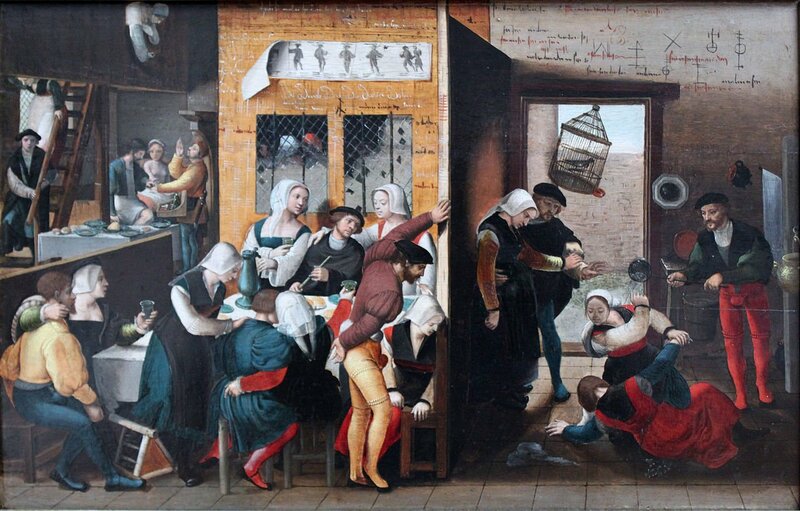 Municipal authorities recognised the usefulness of prostitution in the Late Middle Ages and capitalised on making profits from brothels. They were termed “Frauenhaus”, roughly translated as, ‘House for Common Women’. Council records provided detailed information on the administration of brothels, and recorded all delinquencies. Account books gave Hammer an idea of the types of payments made to, and taken from the brothels. He illustrated his point using the former Austrian city of Bolzano (now Italy). In 1472, the Council of Bolzano established a brothel for the ‘gutted Fräulein’ to live and to avoid a greater evil, as outlined by Augustine. Brothels in Bolzano were located near the hangman’s house, or on the margins of the city, much like prostitutes were relegated to the margins of society. The annual rent was £70 and each Frauenhaus held about 12-13 prostitutes. The brothel keeper changed on average every two years but this could be a longer or shorter period. The brothel keepers were sworn in by the mayor and in cities like Vienna, brothel keepers were only women. Hammer noted that keepers appeared to function as little better than modern day pimps, saying that, ‘In some cities, the brothel keepers brutally forced the prostitutes under their control’. Once a woman was in a brothel, there was little chance she could get out. Regulations controlled prostitutes within the brothels, down to what they were allowed to wear, for example, there was a law that stipulated prostitutes were prohibited from wearing any jewellery in the city of Bolzano. Their lives were exposed to violence and brutality as brothel keepers were permitted to harshly discipline their prostitutes. In spite of tight civic controls, cities encountered problems with keeping marauding soldiers from raiding the brothels. In addition to this issue, was the problem of sweeping religious change throughout Europe. With the coming of Lutheranism and a new sense of morality, brothels fell into decline. Martin Luther preached fiercely against prostitution and ordered the brothels closed. He did not believe brothels were ‘a necessary evil’ or safety valve to protect innocent women from the lusts of men, thus entirely negating Augustine’s earlier admonitions. While the profession certainly didn’t die out the way Luther had hoped, the turn of the tide in religious belief definitely impacted the former prosperity of many brothel owners and no longer filled the coffers of greedy city officials. Still keeping on the topic of prostitution, Christopher Mielke (Central European University, Budapest) turned our attention from Austria to Hungary in his paper, The Best Little Whorehouses in Hungary: The Topography of Brothels in the Free Royal Towns. Mielke is regularly hosts a podcast on CEU’s Medieval Radio in Budapest, a station dedicated to music (pre-1700), history and culture. He echoed Hammer’s comments about common women being a necessary evil in medieval towns, but his paper focused more on a discussion about the location brothels in 4 Hungarian free royal cities. The Procuress (1622) by Dirck van Baburen. Prostitute playing a lute. Sopron is a city located on the Austrian-Hungarian border. The brothel in Sopron was located in the northern end of the city, in the first ring of suburbs between 1330-1380. More city brothels were established where there were trade routes, or near the water so that they were accessible to wealthy merchants passing through the city. Initially populated by German merchants, Košice is a Slovakian city located near the Hungarian border. The brothel in the city was located on the eastern border, away from the market. As with Sopron, the brothel was located next to one of the town gates and near the water within the city walls. Bratislava is located near the Austrian and Hungarian borders. In the Middle Ages, the brothel was located in a fairly advantageous position, near the southern city gate, also known as, ‘the fisherman’s gate’. It was used as a brothel into 1432 when it was ordered out to the suburbs, in 1439, the brothel was moved to the eastern part of the suburbs. In a 1437 document, in the Castle Hill area, there were 322 houses, one clue as to where the brothel may have been located, was ‘Rose Street’. In Sopron, the brothel was also located on ‘Rose Street’. Most of the known brothels were established in the 14th century, including 3 public bath houses from 16th century Buda. Mielke found that all brothels started off being near near water, close to, or inside town walls, near town gates, points of entry, and areas of high traffic, not in typically “marginal positions”.